With all the hype surrounding Kingdom Hearts 3, it’s no surprise that fans and industry press alike are ravenous even the tiniest piece of info about the game. What is surprising however, is that Kingdom Hearts 3 is getting a clothing collaboration with SuperGroupies. The Japanese clothing label sets itself apart by bringing anime fashioned clothing to life modestly. While the products themselves are based in anime and video games the pieces aren’t over the top or verbatim replications, allowing for a unique wearable style based on your favourite series. You can browse their collaboration page here to see what other franchises they’ve brought to life, though many of the items are now out of stock, browsing the pages gives you a good sense of what they do. I recommend looking at the Persona 5 collaboration items. 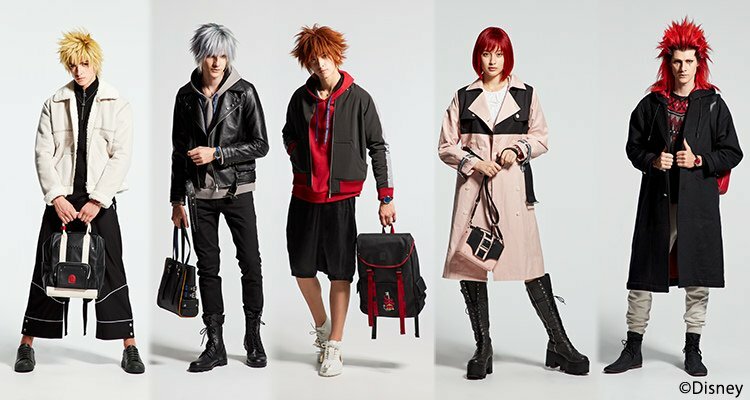 This specific collaboration appears to focus on bringing the styles of five iconic Kingdom Hearts characters to life: Sora, Riku, Kairi, Roxas and Axel. Each of the characters have several items stylized after them, such as an outerwear coat, bag/purse, wallet, stole and pin set, smartphone case, necklace and a watch. If you do make a purchase, you’ll get a collectible “artist’s markup” of the character that matches the piece you’ve ordered drawn by series creator Tetsuya Nomura. While the items are not for sale yet, the purchase period will run from December 1 to December 16 2018; alternatively, if stock runs out before the December 16 they will close up shop so to speak. While SuperGroupies only ships to Japan, you are able to use a proxy service like Tenso to ship worldwide, so that should be considered when buying an item if you’re not in Japan, which is likely most of us. We’ll link you to the collection here so that you can get ready to pull the trigger on your grail when the time comes. And if you need help navigating the convoluted world of international shipping proxies, feel free to drop us a line via Facebook or Twitter, we’ll be glad to help you!